DISCOUNT APPLIED - CONTACT US FOR LATE APRIL/MAY OFFERS !. Corner Cottage sleeps 6 + cot and is a superbly spacious accommodation. 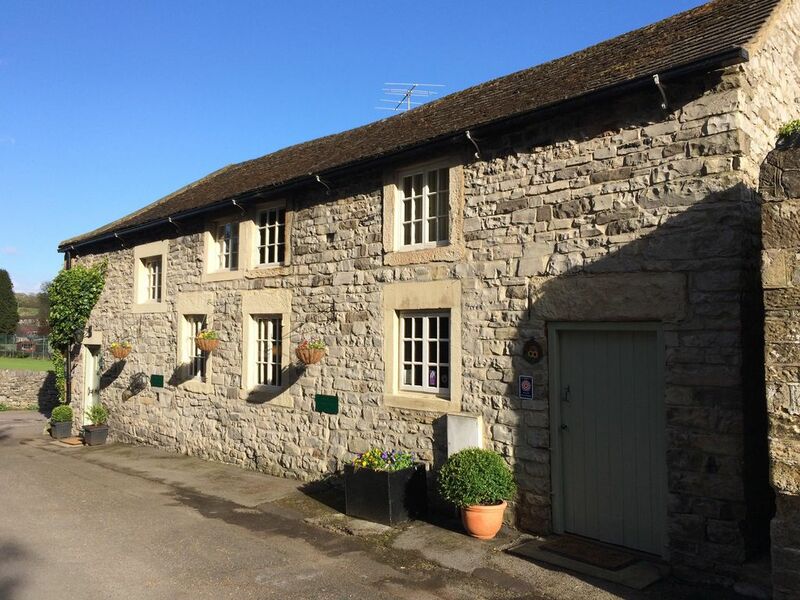 Ashford in the Water is an ideal base for touring, walking or cycling. Two local pubs, restaurants, shops all within walking distance. Convenient for both Bakewell and Buxton. Corner Cottage has 3 large bedrooms and 3 bathrooms. It has fully equipped kitchen and sky plus tv. We have been rated 4 star Gold with Visit Britain. Excellent cottage for short and long term stay. 1 ensuite shower, wc and hand basin, 1 ensuite bath/shower, wc and hand basin. 1 separate third bathroom with shower, wc and basin. 2 Leather sofas with single chair and stool . TV with Sky tv. Enclosed courtyard via the kitchen. Outside: The south facing courtyard has a wooden dining table and 6 chairs. Additionally there is a wooden arbor and a charcoal barbecue Cleaning / Towels / Linen / Maid service: Property cleaned throughout before arrival and all fresh beds made, towels are provided. Other: The dining room has a wonderful large solid wooden table with 6 high back leather chairs. Free wi-fi throughout. Beautiful cottage in a lovely village! Large cottage in a great location, 100 yards to 2 great pubs serving good food. Clean, warm with everything you need for a comfortable stay. Will definitely book this cottage again & hopefully have better weather so we can enjoy the many walks in the area. The flowers & bottle of wine were a lovely touch, thank you Mark & Helen. Great location to explore the Peak District! The cottage was perfect and everything we needed was there. It was spacious and a lovely place to spend Christmas. We absolutely loved it and didn’t want to leave. As a group of 2 families with 2 dogs we found Corner Cottage to have everything we needed and more! Really well stocked and tastefully updated, we were very comfortable and had a lovely long weekend exploring the local area. The cottage is clean, well equipped and has ample parking for 3 cars. Very nice comfy cottage to a very high standard. Fabulous long weekend with our friends! A great base situated in the Peak district National Park close the Monsal Trail ideal for both cycling and walking. Nearby attractions are plentiful including Bakewell, Chatsworth House, Matlock Bath, and Buxton.